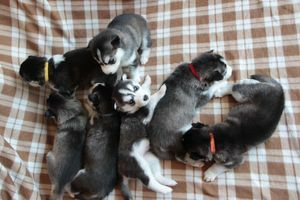 We have our 7 beautiful Siberian husky puppies for sale Both parents can be seen, the mother is black and white and is full KC Registered with all the papers. The Dad is white and is a pure breed his mother was KC Reg but his father wasn't. They have a lovely temperament and great around children.